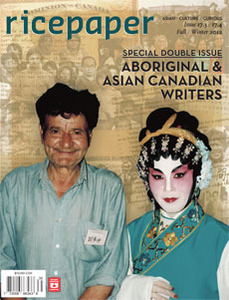 Ricepaper’s new double issue: Aboriginal Asian Canadian Writers is available now. This issue is a product of the collaboration between the Asian Canadian Writers Workshop and the Aboriginal Writers Collective West Coast. Includes a note by guest editor Joanne Arnott, Canadian Métis writer and all-round literary powerhouse. Also includes poetry by yours truly. Be sure to check out Five Elements, an evening of poetry and music and fundraiser for SFU’s Indigenous Poetry and Poetics class. Friday Feb 23rd at 7pm at Rhizome cafe. Readings by Larissa Lai, Jonina Kirton, Janey Lew, Wanda John-Kehewin, Joanne Arnott, Janet Rogers, Kelly Roulette, Larry Nicholson, Laiwan, Arlene Bowman, Alex Jacobs, Annie Ross, and Michelle Sylliboy. This entry was posted in Blah Blah Blah on February 13, 2013 by carleigh baker.